When Pinterest was a baby, one of the first images I remember seeing is a photo of Banff, in the Canadian Rockies. And I just knew: wherever that is, I need to go there. We've been twice now. We went just the two of us for our anniversary one year, and loved it so much that we brought our whole family back with us a couple of years later. This is a trip I would happily take every summer for the rest of my life. We fly into Calgary and rent a car for the drive to Banff and Jasper. Within an hour, I'm weeping from the beauty and I don't really stop until we're back in Dallas. They heal my soul just to behold. A lot of folks get to Banff and go no further. And that's fine. Banff is amazing. If you sit here on the terrace of the Banff Springs Hotel for a week, it's probably a year's worth of therapy. Around Banff, you can go out and paddle around Lake Louise, which is the lake everybody wants to see. (I think Moraine Lake, above, is prettier.) Bear in mind that both Lake Louise and Moraine Lake are enormously popular. Late in the day, Moraine Lake parking may close so you can't even get there. If you're out early, though, crowds are not a problem, and there's not even a line for the canoes. If you keep driving north of Bannff, that's where the fun really begins in my book: Icefields Parkway. Known as Canada's most scenic drive, it's 175 miles of "pull over, I've got to get a photo," plus side-hikes of all kinds: canyons, waterfalls, glaciers. Give yourself at least four hours for this, more if you want to hike along the way. "I gave my heart to these mountains the minute I stood by this river." So you drive into all this beauty, and there are wild flowers and wild animals and there is wild water, and every terrible thing just falls away, lost on the pavement behind you. 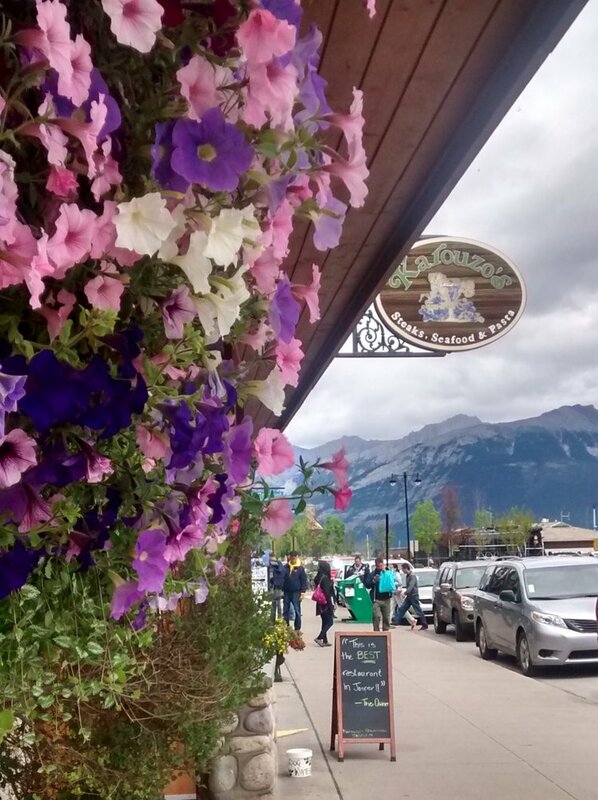 And then you come to the cutest little town on God's green earth: Jasper, where you can find delicious Canadian food like Poutine (it looks funny, but trust me) and Tim Horton's donuts. It can be a bit expensive to stay in Jasper, but we've had wonderful luck with Air BnB in the area. When we went with our family, we had a house with a huge meadow and heart-breakingly beautiful river walks, all in total solitude. All around Jasper, there are more canyons and waterfalls to hike, along with our favorite thing in Jasper: Miette Hot Springs. 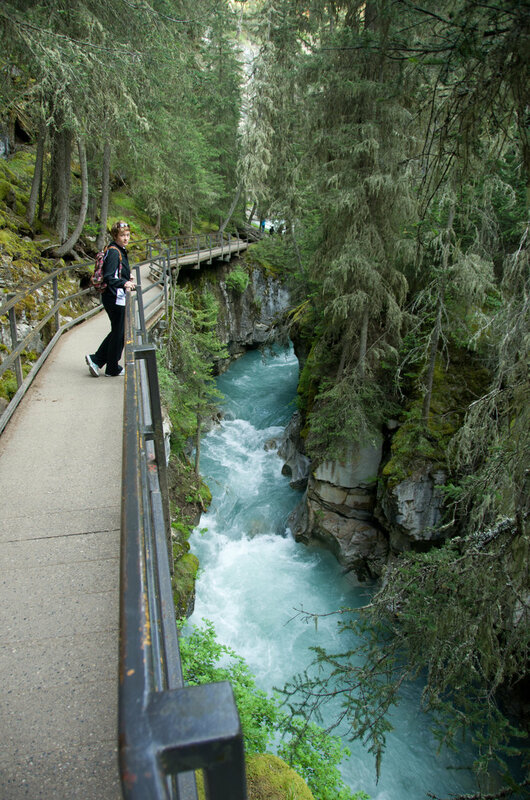 Hike the Sulphur Skyline Trail, which begins in the parking lot of Miette Hot Springs, and reward yourself with hours of perfectly soothing relaxation in the springs afterward. When you have to leave Jasper, there is a bit of good news: you get to drive the Icefields Parkway all over again, headed south this time, and it's always as beautiful as the first time you saw it.